Welcome to another edition of Around the Web Wednesday! 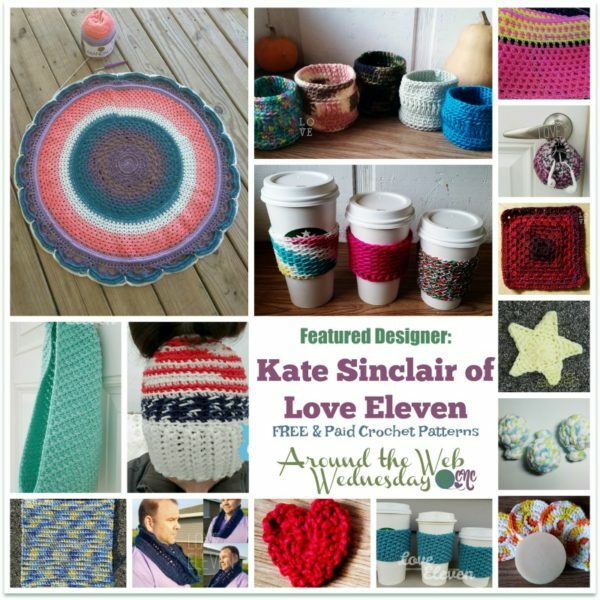 Today we have a special feature of Kate Sinclair of Love Eleven. 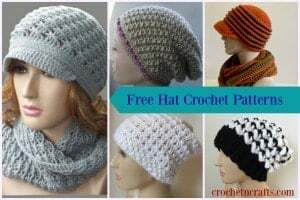 She has a wonderful collection of both free and paid crochet patterns, and today we would like to showcase some of her hottest designs for you. So have a browse here and also be sure to check out her entire pattern collection at her Ravelry Store. 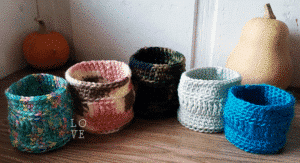 And while you’re there, do let her know that CrochetN’Crafts sent you. She did not specify how long the sale will continue, but if you follow her Love Eleven Facebook Page you’ll be notified of when it ends. Another perk for following her on Facebook is notifications of her new release sales which she likes to hold for 24-48 hours for each new pattern release. Last, but not least, she has a rewards program in which she gives away free patterns. So let’s get started with some of her free and hot designs and then we’ll move on to showcase some of her paid patterns. 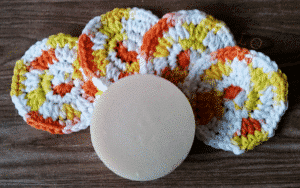 This dishcloth pattern is easy and ideal for crochet beginners. It’s an item that can be used around home, which makes this ideal for adding to any last-minute gift basket. This quick and easy facial scrubber can be used to remove make-up or as a scrubby in your kitchen or bathroom. It too makes for a nice last-minute gift idea for anyone on your list. This cute little heart only asks for 5 minutes of your time, and it’ll give you a lifetime of love. 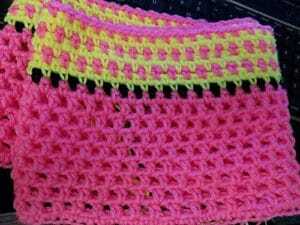 The finished measurement is 1.75″ to 2.5″ depending on yarn and hook size. 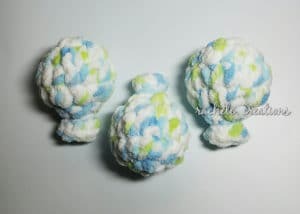 It’s got many uses from appliqueing baby items to hats and bags as well as on envelopes. 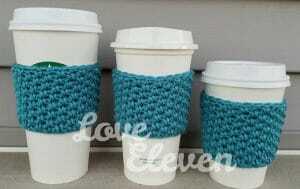 Or, attach a chain of yarn and use it for a bookmark! These are so cute and so perfect for your summer celebrations. I would use them as gift toppers at a child’s birthday party, or as cute decorations and/or toys for children. 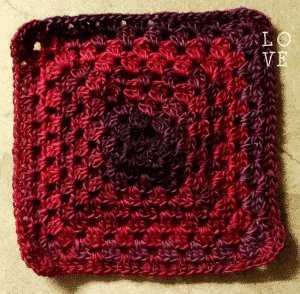 Although available in multiple sizes for squares, this simple granny pattern can be crocheted to any size you like including a full-sized blanket. Here is another embellishment that can be whipped up in just five minutes. It’s a lovely applique for baby and holiday items. The texture is that of a beautiful diamond design, making this a favorite go-to pattern for gifting. And you are free to choose any yarn and hook size. 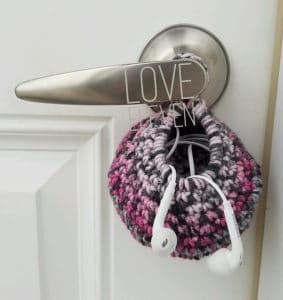 This is perfect for all the music lovers… it hangs by the door so you are sure to remember to take your music along with you when you leave your home. 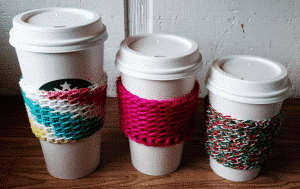 I just love the texture on these coffee sleeves! 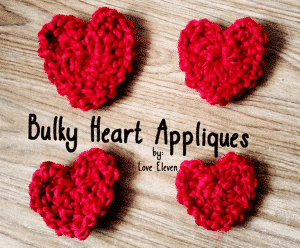 The pattern works up quick, is suitable for beginners and can be adjusted in height as needed. This sleeve looks great in any color, as you can see, and they make for wonderful fillers for a gift basket. 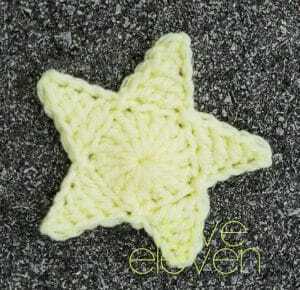 Pattern is suitable for beginners and can be customized for different heights. These treat cups are the perfect way to gift candy to children of all ages. Or, you could use them as an organizer basket. This cowl pattern features a number of options, and one of them includes instructions for beginners. It includes instructions on how to customize the width to any measurement as you like, and the colors are left to your imagination, making it easy for you to match your favorite outfits. 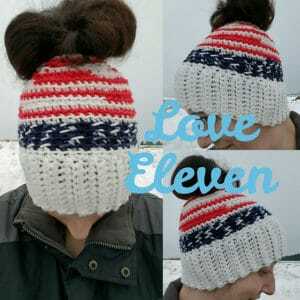 Shown in patriotic colors, this hat can be crocheted to look great in any colors you like. It’s the new style, and perfect for anyone who enjoys wearing their long hair in a ponytail. The sizes include toddler to adult large, along with a size chart for customization. One thing I love about Kate’s designs is her ability to use a number of stitches to create a beautiful look on the overall design. And this is one of my personal favorites… she’s got just enough ribbing, followed by an open stitch and then finished off with a nice wavy textured edge to compliment any of your favorite outfits. And, this cowl was based on the City Centre Square, which is another beauty to enjoy in afghans and other projects. Last, but definitely not least, we have this gorgeous blanket design. 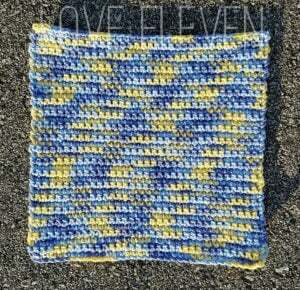 The finished size is 36″, making it great for a baby blanket. 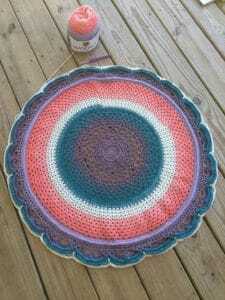 However, given the pretty lacy design I would love this as a pretty doily for a round coffee table. The pattern is currently still in process, but the good news is that once the full version is available, Ravelry has a wonderful feature that automatically sends updates to everyone who makes a purchase now. Could you help me buy those wires in the photo?